Below are the databases you have access to via ProQuest. As there are so many I have split them into broad categories. 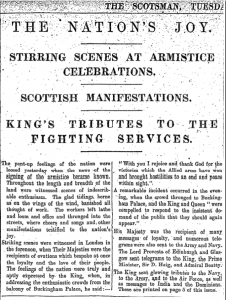 Screenshot from The Scotsman, 12 Nov 1918, pg. 3. Accessed 18th January 2018. These can all be accessed via the Newspapers & Magazines database list. 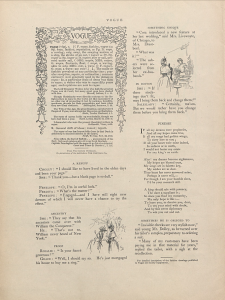 Screenshot from first ever issue of Vogue (U.S.), Vol. 1, Iss. 1, (Dec 17, 1892), pg. 2. Accessed 18th January 2018. Similar to the newspaper archives the Library has access to databases that cover collections of different periodical titles, such as American Periodicals which contains over 1500 full-text periodicals published in between 1740 and 1940, Art & Architecture Archive (covering 1895-2005), British Periodicals which contains full text of hundreds of periodicals from the late 17th century to mid-20th century and Periodicals Archive Online. As well as the archives for individual titles, such as Country Life Archive (1897-2005), Entertainment Industry Magazine Archive (1880-2000), Harper’s Bazaar Archive (1867 onwards) and The Vogue Archive (U.S. edition), from the first issue in 1892 onwards. These databases are fully searchable with full-page and article images in easily downloadable PDF format, allowing you to see the articles, illustrations, photographs, advertisements, etc. The Library has access to a number of databases from ProQuest’s government programme, looking at both the U.K. and the U.S., that give unprecedented access to official and declassified documents. From the U.K. side of things we have access to both the House of Commons Parliamentary Papers and the House of Lords Parliamentary Papers (1800-1910). These are cross-searchable and often just referred to as U.K. Parliamentary Papers. Between them they cover around 3 centuries of rich primary source material about Britain, its colonies and the wider world. You may also be interested to look at Documents on British Policy Overseas, a collection of primary source documents from Britain’s Foreign and Commonwealth Office, shedding light on diplomatic history throughout the twentieth century. From the U.S. the Library has access to ProQuest Congressional Basic which includes abstracting and indexing of all publications of the U.S. Congress back to 1970, plus bill tracking, legislative histories, and full text of selected documents. Or you may be interested in the fantastic Digital National Security Archive (DNSA). DNSA gives you access to a vast collection of important declassified U.S. government documents. This provides valuable primary source material central to U.S. foreign and military policy since 1945 and helps advance research in history, politics and international relations. The Library currently has access to 11 collections through DNSA covering such events at the Vietnam War, the Cuban Missile Crisis, the Iran-Contra affair, Iraqgate and more. 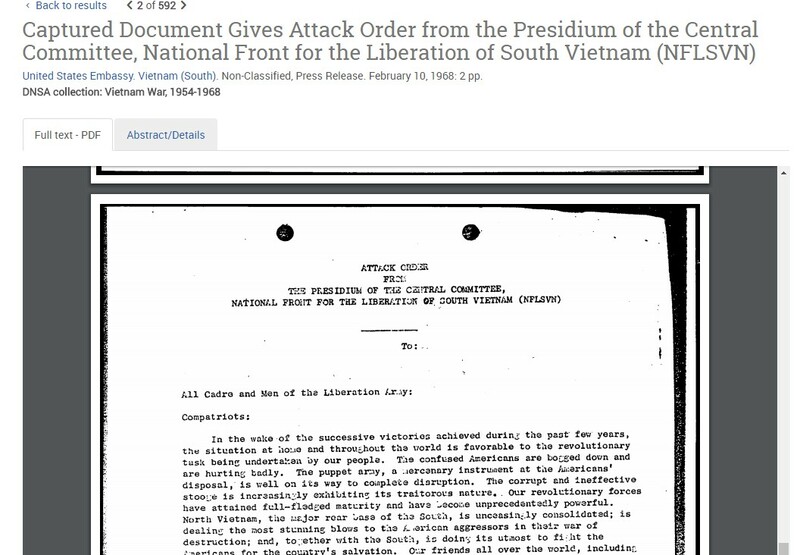 See Spotlight on Digital National Security Archive (DNSA) for more detailed information on individual collections and see also New to the Library: 4 new collections of declassified U.S. government documents for more details on the new collections we purchased from DNSA last year. United States Embassy. Vietnam (South). Non-Classified, Press Release. February 10, 1968: 2 pp. Accessed 17th June 2016. These can all be accessed via the Primary Source databases list. Early English Books Online (EEBO) contains digital page images of virtually every work printed in England, Ireland, Scotland, Wales and British North America and works in English printed elsewhere from 1473-1700 – from the first book printed in English by William Caxton, through the age of Spenser and Shakespeare and the tumult of the English Civil War. 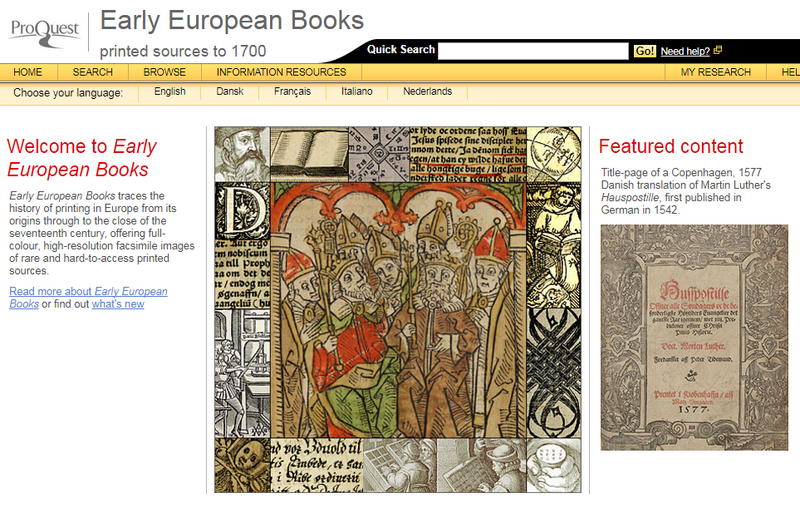 Building on the success of EEBO, Early European Books Online traces the history of printing in Europe from its origins through to the close of the 17th century, again providing high quality digital page images of rare and hard-to-access printed sources. The Library currently has access to Collections 1-4 and UK Collections 5 and 7. Acta Sanctorum is a collection of documents examining the lives of saints, organised according to each saint’s feast day. This database is the electronic version of the complete printed text of Acta Sanctorum, from the edition published in sixty-eight volumes by the Société des Bollandistes in Antwerp and Brussels. Patrologia Latina is an electronic version of the first edition of Jacques-Paul Migne’s Patrologia Latina, published between 1844 and 1855, and the four volumes of indexes published between 1862 and 1865. The Patrologia Latina comprises the works of the Church Fathers from Tertullian in 200 AD to the death of Pope Innocent III in 1216. These can all be accessed via the Databases A-Z list. Academic Video Online and MediaPlus give you access to 10s of 1000s of videos, as well as images and sound recordings. 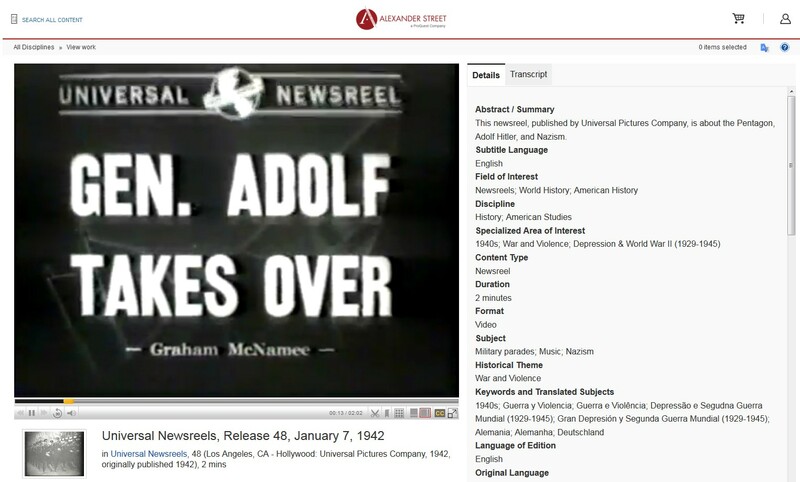 These two video streaming databases include scholarly video material of virtually every video type: documentaries, interviews, performances, news programs and newsreels, field recordings, commercials, demonstrations, original and raw footage. There are thousands of award-winning films and previously unavailable archival material. Screenshot from Academic Video Online. Accessed 23rd March 2017. Music and Dance Online delivers the largest, most diverse catalog of music content in the world. The multimedia resource features works from thousands of respected partners, covers hundreds of genres from alternative rock to zydeco and from alternative dance to operatic arias, and encompasses a wide range of content formats—including scores, reference, and high definition audio and video. You may also be interested in looking at Alexander Street Press’ open access database, Open Music Library which brings together peer-reviewed journal articles, books, music scores, audio, and video recordings from the world’s digital collections. Are you researching royalty, the Victorian period or just a fan of ITV’s Victoria? Queen Victoria’s Journals may be for you. This database reproduces every page of the surviving volumes of Queen Victoria’s journals as high-resolution colour images, along with separate photographs of the many illustrations and inserts within the pages. In total 141 volumes have been digitised. Underground and Independent Comics, Comix, and Graphic Novels is the first-ever scholarly online collection for researchers and students of adult comic books and graphic novels, covering pre-comics code era works to modern sequential releases from artists the world over. Through the database you can explore 200,000 pages of original material alongside interviews, commentary, criticism, and other supporting materials. Screenshot from Underground and Independent Comics, Comix, and Graphic Novels. Accessed 18th January 2018. The open access database Ruth Fulton Benedict Papers gives you free access, for the first time, to a large portion of noted American anthropologist Ruth Benedict’s professional and personal papers. This is a fascinating archive from one of the first women to make major contributions to the study of anthropology. Education at Alexander Street Press focuses on the development and training of teachers. Content includes primary-source footage of students and teachers in actual classrooms, demonstrations, lectures, and documentaries to help both new and experienced teachers develop their abilities to teach, mentor, understand, and communicate with students of all levels of need and you have access to over 3800 videos. Update: The Library also now has access to New York Amsterdam News (1922-1993) and News, Policy & Politics Magazine Archive from ProQuest. To access any of the above listed databases or other primary source databases available from the Primary Source, Newspapers & Magazines, Images & Moving Images lists or the Databases A-Z list. Adam Matthew and Gale Cengage will also be taking part in the Discovery Day on 30th January. See my previous posts throwing a Spotlight on Adam Matthew digital primary sources and a Spotlight on Gale Cengage digital primary sources. Look out for a “Spotlight on…” post about the Centre for Research Collections soon. This entry was posted in Library, Online resource, Primary sources, Spotlight on and tagged 18th century, 19th century, 20th century, archives, Asia, books, Britain, China, correspondence, cultural history, Databases, E-books, Europe, First World War, History, India, International Relations, Latin, Letters, magazines, Manuscripts, newspapers, Politics, primary source, social history, Spotlight on, United States by cstirling. Bookmark the permalink.